so here we go, team. post 1 of 8 from portland. i wasn't lying when i said these travel posts go into april. we landed in portland around lunch time ... so obvi, needed food asap. we took a gander at some of the food trucks near our hotel. even though there were plentiful vegan options, none were speaking to me. that's when josh & i remembered a recommend from our friend / fellow chicago vegan, taylor ... enter los gorditos. about : "taqueria los gorditos opened in 2006... the food truck's popularity quickly spread among meat-eaters & vegans/vegetarians alike, & eventually earned a cult-like following of sorts among the vegan community." you hear that?? cult-like following. now, there are several brick & mortar locations of los gorditos around portland. we found ourselves at the pearl district location ... ready for some nomz on the vegan menu. 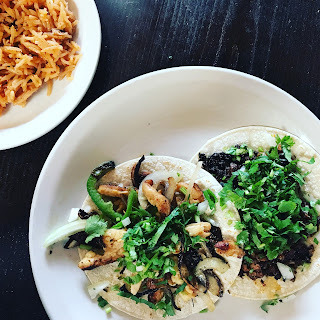 soyrizo taco & soycurl taco. ultra delicious. perfect, semi light lunch only improved by the plethora of salsa options. 5 out of 5 taco stars. i would say that los gorditos is a must stop for vegans traveling to or living in portland ... also, los gorditos ... if you're listening ... how about a midwest outpost in chicago? ?